Ever since Bella was born in August 2014, her parents had a feeling there was something not quite right with her development. She lacked strength and coordination and she did not move much. As a baby, she was never able to lift her head up while laying on her belly. As she grew she could never crawl, stand on her own, or walk. 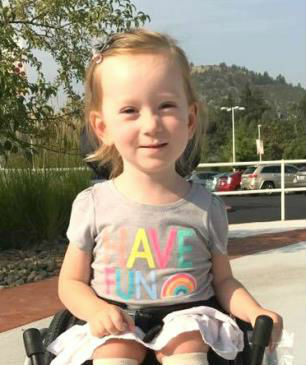 Her parents thought maybe she was just a bit delayed, but after months of waiting on the results of their second round of extensive genetic testing… Bella was diagnosed with Merosin-Deficient Congenital Muscular Dystrophy (MDC1A). Congenital Muscular Dystrophy is a rare disease which limits Bella’s muscles and mobility. Experts estimate that this form of Muscular Dystrophy affects 1 in 200,000 people. Bella will likely never walk and will need assistance for the rest of her life doing things that many of us take for granted. Bella’s parents carry her everywhere because she cannot stand or walk. Even when they set her down somewhere they make sure she is surrounded by pillows so that if she falls over she doesn't hurt herself. Nothing has ever come easy for Bella, but her motorized wheelchair helps give her independence that she loves! Luckily, at this point, it doesn’t seem that Bella has any cognitive delays. She is bright and takes in the world around her. She is sociable and loves being around other kids and watching them play. Of course, there are moments when she becomes frustrated that she is unable to do the things that other kids are doing. She’s aware of her limitations but doesn’t let that stop her from trying to do things on her own, whenever possible. In spite of all her challenges, Bella has an incredible spirit and positive outlook. She is so much fun to be around! She is up for anything! She always wants to be helpful and enjoys anything that brings her independence. She is a happy, vibrant and otherwise normal little girl who loves Curious George, painting, being out in nature, music, singing, bubbles and hot chocolate. Sparrow Cash raised for Bella will help with ongoing medical expenses, special equipment that she needs, and everyday living expenses. Students at Seven Peaks School will “earn” Sparrow Cash by completing a minimum of 256 hours of sponsored community service.